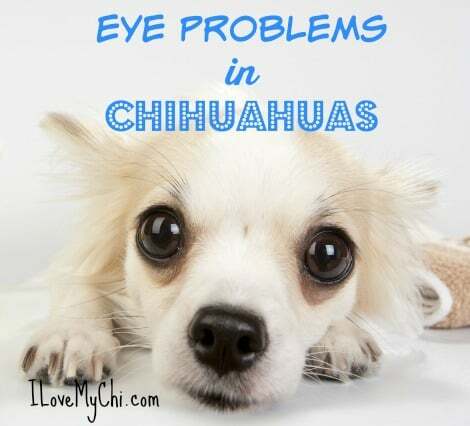 For Chihuahuas, eye problems can be a significant cause of concern. 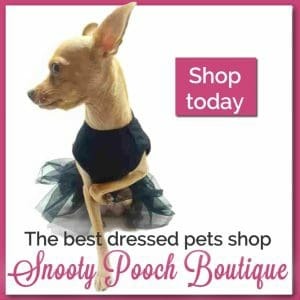 After all, while they are a relatively healthy dog breed, their protruding eyes and close proximity to the ground put them at a high risk for both eye problems and infections. 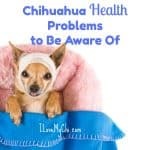 The following examines the most common eye problems in Chihuahuas, as well as the causes and treatment options. 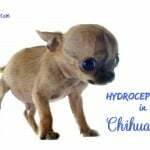 If your veterinarian determines your Chihuahua is suffering from dry eye, he or she will likely order eye lubricating drop or medication designed to stimulate tear production. In addition, you can gently wipe your Chihuahua’s eyes with a warm washcloth several times a day, especially after they have woken up. While it may not seem like a serious condition, dry eyes do have the potential to cause permanent damage or blindness if left untreated. If this is something small, you may be able to use saline solution to flush the object out of his eye. If flushing is ineffective, you will need to go to the vet immediately, where they have both the proper training and equipment to safely remove the object. Usually caused by the type of breed, aging, or inflammation of the uvea (the eye’s middle layer), corneal endothelial dystrophy occurs when not enough fluid is getting to the cornea (the eye’s outer layer), which leaves it dehydrated and causes the cornea to take on a bluish haze. This hazy color tends to be the first indication of a problem, though if it is allowed to progress, your Chihuahua may also exhibit some visual impairment. 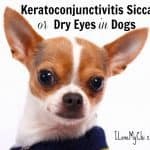 If your dog suffers from this eye condition and the vet determines he needs treatment, a topical hyperosmotic agent that draws fluid out of the eye and reduces intraocular pressure, will most likely be prescribed, though in some cases no treatment is needed. 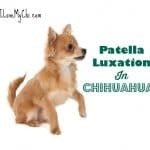 This is a life-long condition and tends to be especially severe in Chihuahuas. Treatment usually includes topical antibiotics, medications that control eye muscle spasms, and pain medication. 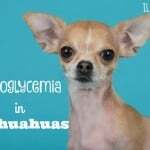 If your Chihuahua continues to paw at his eye, he may be fitted with a neck collar. Thankfully, they usually heal in less than a week. Though it is not very common, lens luxation is an eye condition you should be familiar with. Treatment is dependent on the location of the lens and the potential for vision. Typically, this includes surgically removing the lens and lowering the pressure within the eye. In severe cases, the removal of the entire eye may be necessary. Cataracts usually happens when a dog gets older. It causes the dog’s pupil to become cloudy and whitish and the dog’s vision will worsen over time, eventually causing blindness. Surgery is the treatment for this condition. Dogs with glaucoma often become blind from the condition. It is caused by pressure on the optic nerve by a fluid buildup. It can also cause headaches for the dog. Surgery is usually the treatment for this and sometimes the eye has to be removed. Cherry eye is the prolapsed gland of the 3rd eyelid. It causes no pain or vision loss but it does look odd. It can be cured by a steroid ointment but if that doesn’t work, then surgery is recommended. 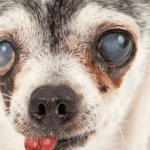 This is just a look at some of the eye problems Chihuahuas frequently experience. Keep in mind that the preceding information is meant to be informative and should not be used in lieu of a visit to the veterinarian. If your dog is having eye problems, please get them checked out by your vet. If it’s under the eye Tracey, it sounds like tear stains. As a former groomer, we saw this a lot. It’s more noticeable in light colored dogs but you can see it in other colors too. You can get something called Angel Eyes wipes at your local pet store or on Amazon here http://amzn.to/2qnr51a (that’s an affiliate link) to gently wipe under the eyes to get rid of it. If it’s only happening under one eye, it could be a blocked tear duct or other eye problem that should be checked by your vet. My chiwawa is starting to get a cloudy greenish blue tinge to his eyes. But it’s only noticeable in certain lighting, also he paws at he’s eyes a lot. It really has me worried. What could be wrong? No that’s not normal Deborah. Dogs do see better from the side than the front because of the way their eyes are placed, but they still should be able to see in front of them. I would ask your vet what can be done, of anything to help your fur baby see better. My chihuahua has one eye that at first started with a red conjunctiva and the third eyelid slightly protruding and then orbital swelling. He was initially put on clavamox bid and an anti inflammatory. This didn’t help. We saw a veterinary ophthalmologist and he gave as prednisolone eye drops to use qid. He at first improved but after the 4th day the eye started to exhibit redness and swelling again. He is now pawing at it and squinting. We have an ultrasound scheduled for next week. I am just wondering if you have any thoughts? Poor little chi! I can’t imagine what that could be. What does the vet say? Could it be a tumor? Keep us updated and let us know what happens with the ultrasound Marketa. My little chi boy is 7 months old and he seems to be having slight problems seeing close up what should I do? And does that mean he has eye problems he also has runny eyes that some time has eye buggers Please Help. The runny eyes is pretty common and could be allergies. That could make it harder for him to see too. When you see the eye boogers, wipe them out with a damp washcloth. Next time you are at your vet’s mention that you think he is having trouble seeing close up and let them check him. My chi puppy was fine two days ago when I got home from work tonight my pups eyes could not open I cleaned all the eye boogers away but he still will not open them on his own what do I do? Is he okay otherwise Matthew or is he acting sick? If it’s just the eye thing and otherwise he’s acting normal, it could be allergies or more seriously, an eye infection. If he can’t open them, take him to a vet because you don’t want to risk blindness. 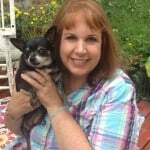 Our Chihuahua had very severe glaucoma and the eye doctor was able to reduce it dramatically (to a 3) with eye drops. That’s great Kay! What kind of drops are they? Is it a prescription? I just noticed my Chi has a swollen eye. How do I get the swelling down? 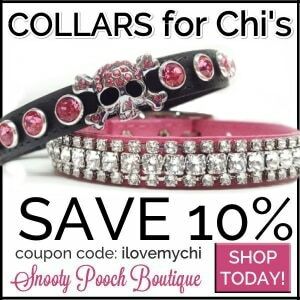 Yikes, get your chi to a vet as soon as possible! You don’t want your fur baby to lose their eye!